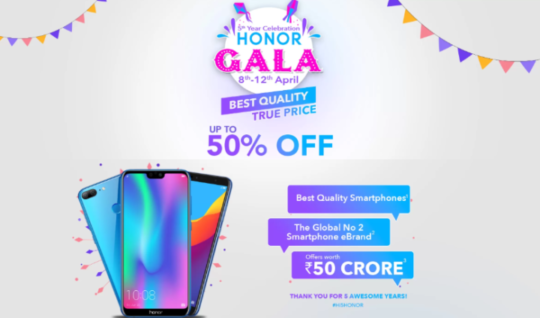 Huawei sub-brand Honor is celebrating 5 years of sale in Indian market by introducing ‘Honor Gala Festival Sale’ from April 8 to 12 for its customers. The sale consist of great offers on Honor budget and Mid-range Smartphones. The Company mentioned up to 50 % OFF on devices like Honor 9N, Honor 9 Lite, Honor 7A, Honor 7N, Honor 9i, Honor 10 Lite and the last Honor 10 on Flipkart. The Sale will be available on both Flipkart and Amazon for limited time. On Flipkart offers worth Rs. 50 crores is also mentioned. Offers are not only on Smartphones but on some Honor products like wearables, and tablets on Amazon. Talking about offers & Discounts firstly you’ll see Honor 9N on the list, for 4+64GB variant the original pricing is Rs is 13,999, but in the sale the price went down to Rs 9,499. Next in the list you’ll find the Honor 9 Lite, here the company also claims that they have already sold more than 1.5 Million units of the phone. 4+64GB variant of Honor 9 Lite is priced at Rs. 9,499, which was earlier priced at Rs. 14,999. Offers on budget phones like Honor 7A, Honor 7S and Honor 9i are also present. The Honor 9i 4+64GB variant is listed at Rs.10, 999, which was earlier priced at Rs 19,999. The Honor 7A with 3GB+ 32GB is priced at Rs. 6,999 and Honor 7S with 2+ 16GB variant is priced Rs. 5,499 respectively. Next up you’ll find The Honor 10 Lite with 4+64GB which is priced at Rs 12,999, the earlier price of this phone was Rs, 16,999. Now on the list lastly you’ll see the Honor 10 6GB+128GB variant priced at Rs. 24,999, which was launched at the price tag of Rs. 32,999. On Amazon there are some difference set of offers, likely on the Honor Play, The Honor 7C’s and The Honor 8C. Talking about wearables that we mentioned earlier, the Honor Band 4 will be available at Rs. 2,499, which is just Rs. 100 OFF from the original price. Discount of Rs. 100 is also on Honor Band 4 Running Edition which will be available at Rs. 1,499. For updates on more offers & Launches stay tuned with Alloftop.